What exactly happens in the Divine Liturgy, the most important form of worship in the Eastern Orthodox Church? Where did it come from? How was it formed? What are its roots, its history, its purpose, and most importantly, its relevance (particularly to me, an ordinary person trying to understand and participate in it in the 21st century)? These were the questions I started with when I began Orthodox Worship. When Ancient Faith Publishing sent me a copy of this updated and revised edition in exchange for an honest review, I expected to learn about the historical, (and I’ll admit) academic side of Eastern Orthodox worship. I was curious about the Jewish roots in our services and wanted to understand the continuity between how early Christians developed worship over 2,000 years ago and how it’s continued today. 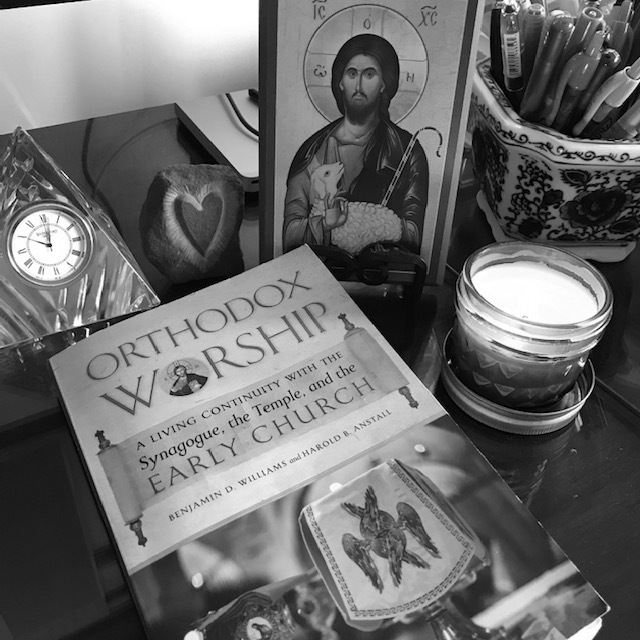 However, I quickly realized this book was doing so much more than answering basic questions about the history of Orthodox worship: it was illuminating for me the “deep, personal, and spiritual worship experience before the very Throne of God” (9) – the very purpose of Orthodox liturgical worship. In other words, it changed the way I approach the Divine Liturgy. This book is divided into three parts, and I encourage any reader to take their time with all three. The information is accessible to a modern reader, but it is dense. What you will learn about Orthodox worship is that nothing happens in it without meaning. Everything that has developed in Orthodox worship practices, which grew directly out of “two elements of Jewish worship – synagogue and temple” (17), is linked to apostolic worship. From the prayers said during the service to the Scripture reading to the order of events of the Divine Liturgy itself: all is deeply steeped in an unchanging tradition. This information is heady, which is why I recommend that readers really give themselves time to really digest book. Sit down with this book with a cup of tea, a candle, or a calming view, and keep a pencil in your hand (I underlined and highlighted things constantly as I read). This is not a book that you want to rush through, but rather, enjoy slowly and really contemplate. First, Part I covers understanding the Diving Liturgy: how Christian worship developed, what worship in the early church looked like, the importance of revelation and worship, what “the royal priesthood” means in an Orthodox context, and lastly, how all this connects to heavenly worship, which is a “present spiritual reality” (94). If this seems overwhelming, that’s okay. One of the things that was so beneficial about this section was that the authors explain how Orthodox worship is a universal, richly symbolic and meaningful experience that culminates in a real, living, and transformative moment of union with God. As a convert from Protestantism to Orthodoxy, I could have benefited from Part I of this book 10 years ago. It would have helped me better understand the great continuity in Orthodox worship to apostolic tradition – the way the disciples and apostles worshiped and how Christian worship directly grew from that. Williams & Anstall also did a remarkable job in Part I guiding the reader through the historical roots of Orthodox worship and how it directly grew out of Jewish worship practices at the time. Because I am someone who values context, this section really helped me understand how worshiping today directly relates not only to what was happening 2,000 years ago with the first early Christians, but more astoundingly, what is also happening at the same moment when one participates in the Divine Liturgy today. According to the authors, “Worship on earth, then, is … an extension, a reflection, of worship in the Kingdom” (93). Part II of this book – A Journey through the Liturgy – is when my understanding of the Divine Liturgy really began to change. In this section, the authors explain how exactly an Orthodox Church is organized (which was fascinating to learn), the preparations that take place for the Divine Liturgy, and then what happens, step-by-step, during the Divine Liturgy itself. The authors break down each moment in the Divine Liturgy and explain the history, context, and living symbolism behind each action and prayer and the overall importance and effect each step has on the worshipper. All of this culminates in the Eucharist, “the most glorious, most joyous, and most elevating event permitted to humanity … where two worlds meet, this world and the world to come” (145). This section impacted me deeply. As I read, I compared my former attitude, approach, and rational understanding of worship to what the authors explained was really happening on a deeply spiritual level, and I have to say, it transformed the way I participate in services. When you realize that you aren’t “just” attending church in your little corner of the world on a regular Sunday, but rather, that time and space are dissolving and you are literally at the throne of God, celebrating something that is happening throughout heaven at that very moment, well … that changes the way one might approach the Divine Liturgy. After reading this book, I find myself more present, more aware, and more observant at the Divine Liturgy. Part II ties into the Conclusion, the final chapter, which includes “a call to worship” and reminds the reader how just “[l]ike any other relationship … [c]ommunion with God requires time and effort” (189). One of the most impactful reminders the authors give the reader is that “the sacramental life of the Church leads to a sacramental view of all of life: to view all things as having come from God and to offer all things back to God in thanksgiving and praise” (191). This is what the early apostles, disciplines, and early Christians did, and the authors remind the reader this is a modern calling, as well. Overall, I recommend this book to anyone who (1) is unfamiliar with Orthodox worship and wants to know more about its history and development; (2) wants to learn about how modern day Orthodox worship relates to worship in the early church; and (3) might be an Orthodox Christian who wants to expand his or her understanding of what exactly the Divine Liturgy is and why it’s so important. You do not need to be an Orthodox Christian to find this book useful. I’ve recommended it to my non-Orthodox and Orthodox friends. You can purchase this book from Ancient Faith Publishing or Amazon!